The command ps can be used to list processes, called jobs, that are running. 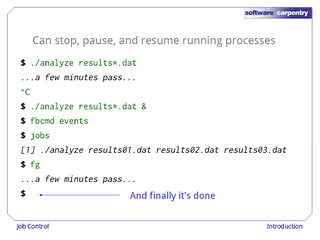 Appending a & to the end of a command makes that command run in the background. 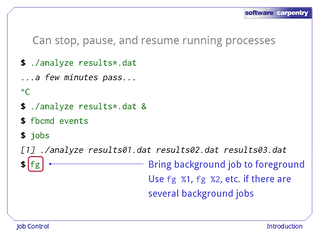 Jobs can be moved to and from the background using fg and bg. 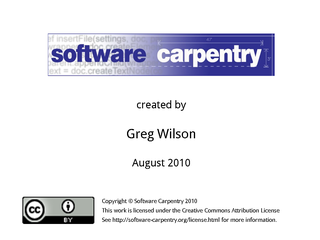 Hello, and welcome to the seventh episode of a longer-than-expected Software Carpentry lecture on the Unix shell. This episode will take a quick look at job control, a topic that's less important today than it was back in the Dark Ages, but which is coming back into its own as more people begin to leverage the power of computer networks. 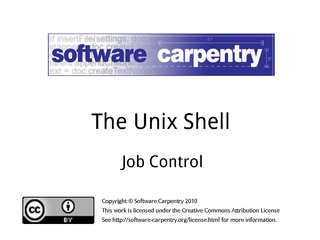 We're looking at how to control a computer using a command-line shell. …which tells the shell to use the output of one as the input of the next. What we'll look at in this episode is how to control programs once they're running. What we really mean by that is how to control processes. 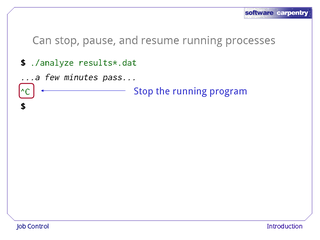 A process is just a running program. 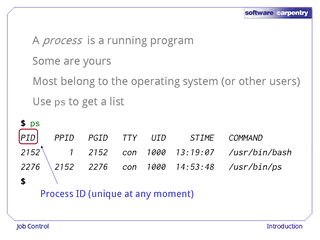 Some of the processes on your computer are yours: they're running programs you explicitly asked for, like your web browser. Many others belong to the operating system that manages your computer for you, or, if you're on a shared machine, to other users. 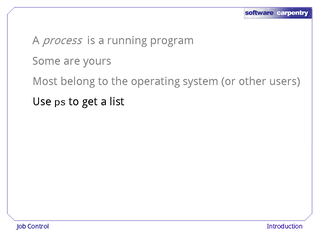 You can use the ps command to list them, just as you use ls to list files and directories. Here's some typical ps output. 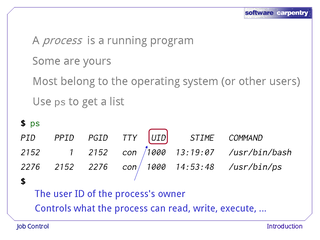 Every process has a unique process id. 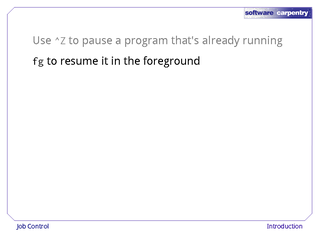 Remember, this is a property of the process, not of the program that process is executing: if you are running three instances of your browser at once, each will have its own process ID. 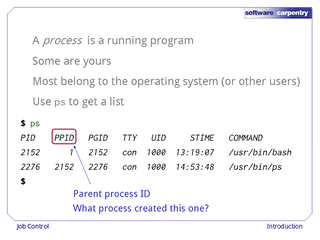 The second column in this listing shows the ID of each process's parent. 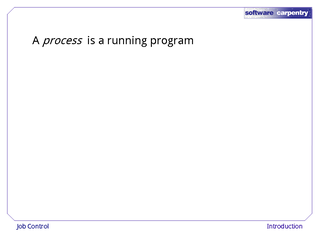 Every process on a computer is spawned by another, which is its parent—except, of course, for the boot process that runs automatically when the computer starts up. 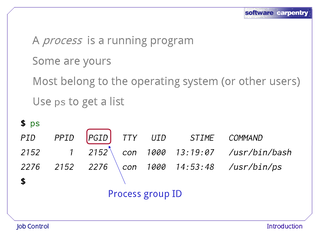 The third column is the ID of the process group this process belongs to. We won't discuss process groups in this lecture, but they're often used to manage sets of related processes. …except that if a process is a system service, such as a network monitor, ps will display a question mark for its terminal, since it doesn't actually have one. Column 5 is more interesting: it's the user ID of the user this process is being run by. 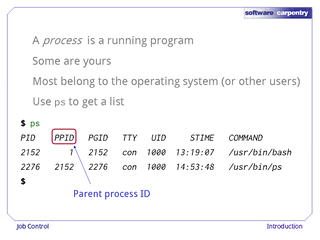 This is the user ID the computer uses when checking permissions: the process is allowed to access exactly the same things as the user, no more, no less. 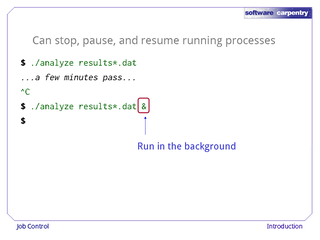 …and Column 7 shows what program the process is executing. 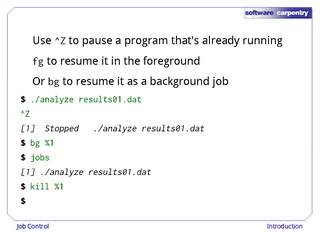 Your version of ps may show more or fewer columns, or may show them in a different order, but the same information is generally available everywhere. The shell provides several commands for stopping, pausing, and resuming processes. To see them in action, let's run our analyze program on our latest data files. After a few minutes go by, we realize that this is going to take a while to finish. Being impatient, we kill the process by typing Control-C. 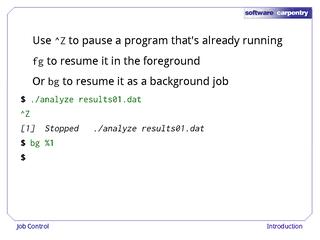 This stops the currently-executing program right away; any results it had calculated, but not written to disk, are lost. …with an ampersand & at the end of the line to tell the shell we want it to run in the background. 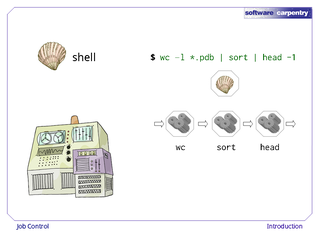 When we do this, the shell launches the program as before. Instead of leaving our keyboard and screen connected to the program's standard input and output, though, the shell hangs onto them. 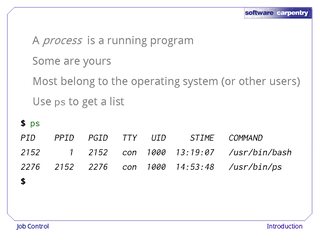 This means the shell can give us a fresh command prompt, and start running other commands, right away. Here, for example, we're checking for new Facebook events. 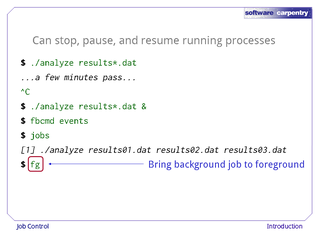 Since there's nothing going on, let's run the jobs command. 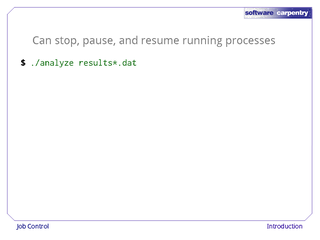 This tells us what processes are currently running in the background. Since we can't think of any other way to procrastinate, we can use the foreground command, fg. This brings our background job into the foreground. If we have several jobs running in the background, we can control which one we bring to the foreground using fg %1, fg %2, and so on. 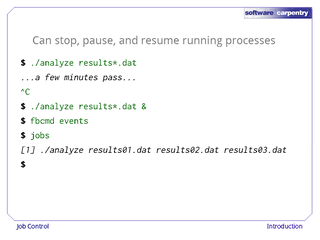 The IDs are not the process IDs; instead, they are the job IDs displayed by the jobs command. Finally, when analyze finishes running, the shell gives us a fresh prompt as usual. 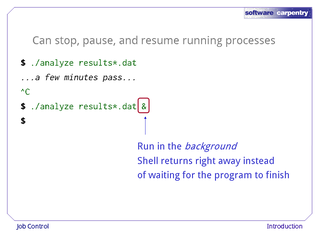 The shell gives us one more tool for job control: if a process is already running in the foreground, Control-Z will pause it and return control to the shell. 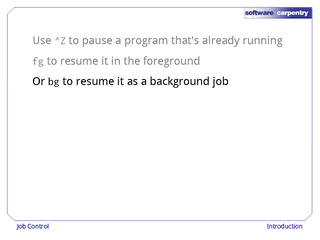 …or bg to resume it as a background job. 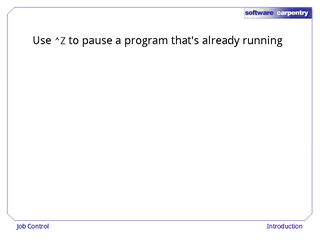 …and then type Control-Z. The shell immediately tells us that our program has been stopped, and gives us its job number. 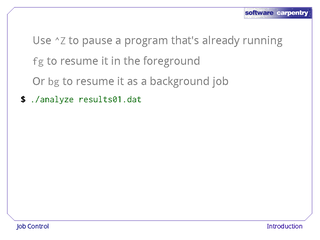 If we type bg %1, the shell starts the process running again, but in the background. …and if we want, kill it while it's still in the background using kill and the job number. 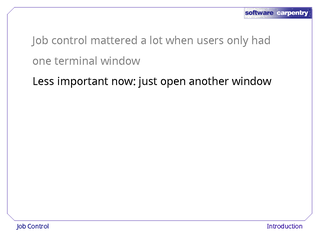 This has the same effect as bringing it to the foreground and then typing Control-C.
Job control was important when users only had one terminal window at a time. 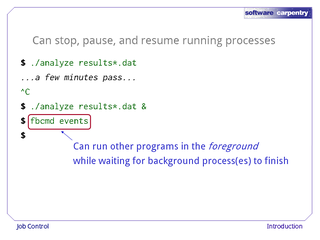 It's less important now: if we want to run another program, it's easy enough to open another window and run it there. 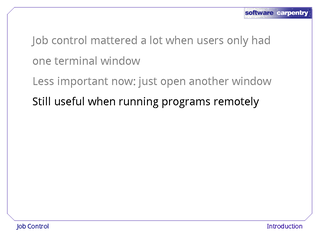 However, these ideas and tools are making a comeback, as they're often the easiest way to run and control programs on remote computers elsewhere on the network. A future episode will take a look at how we can do that securely. 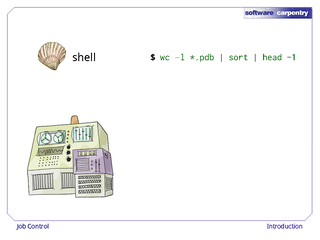 First, though, we need to look at shell variables.